Klipboard App | Requirements for iOS and Android Including Operating Systems, Version Requirements & Mobile Devices. Klipboard mobile apps are available on iOS and Android as downloadable apps via the respective app stores. Klipboard has updated the requirements for using its service, the mobile platform requirements for using the app, as well as the devices that we use for performance testing as Klipboard continues to improve the user experience. 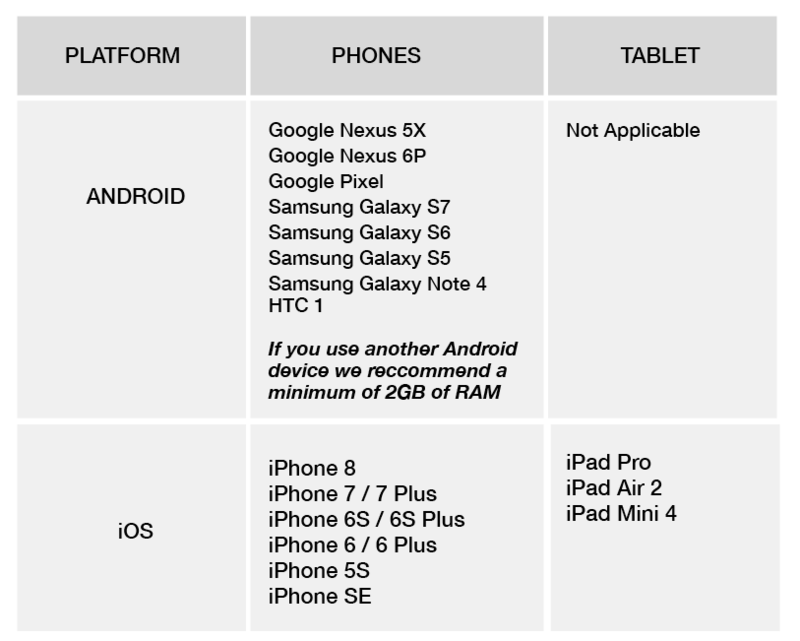 Users can run Klipboard on phones and tablets that meet these mobile platform requirements. To allow Klipboard to stay current in the rapidly moving mobile market, minimum platform requirements are required and are subject to change at any time, at the sole discretion of Klipboard. This may be with or without advance notice. Klipboard regularly tests the downloadable apps, both automated and manual on a range of mobile devices. For the latest release, this is the list of devices used for Klipboard testing. Customers are not prohibited from using Klipboard on untested devices that meet these current platform requirements, however we cannot guarantee performance on other hardware. To allow Klipboard to stay innovative in the rapidly evolving mobile market, the list of tested devices is subject to change at the sole discretion of Klipboard, with or without advance notice. All customers whose devices meet current minimum platform requirements, are eligible to receive any Klipboard feature updates and/or fixes that may occur. Our goal is to release Klipboard feature and functionality updates to coincide with each Klipboard major release. This information is provided to help with your release planning but is subject to change, at Klipboard’s discretion. Enhanced features and functionality are provided in major version updates. We aim to release a new major version of the downloadable apps after the completion of each Klipboard major release to all production instances. The timeframe in which a new major version is released varies and may be impacted by factors outside of Klipboard’s control, including new requirements from Apple or Google or changes to the iOS or Android operating systems. Customers can install new major and bug fix versions of the downloadable apps from the App Store and Google Play as long as their mobile devices meet Klipboard’s current minimum mobile operating system requirements. If a device is running an older operating system, updated versions of Klipboard won’t appear in the app stores. When customers run Klipbaord on Klipboard tested devices, it’s more efficient for us to troubleshoot issues with the mobile app. For customers using untested devices, even those meeting minimum platform requirements, we may not be able to replicate some issues due to device manufacturer specifc customisations. Running Klipboard on older devices or devices with low computation and memory capabilities may adversely impact performance of the app, as compared to performance on Klipboard tested devices.